Professor Conway joined the Simon School in 2009 and has served as Associate Dean of Masters Programs from 2009-13 and Senior Associate Dean of External Engagement and Planning from 2013-14. She has overseen the Admissions and Career Management Center and worked to enhance corporate outreach and visibility of the Simon School. She also worked with students to create international learning/networking opportunities. 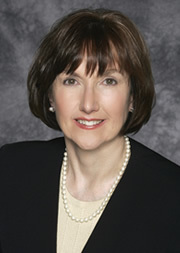 Prior to joining the Simon School, Conway was a tenured faculty member at the University of Southern California (U.S.C.) Marshall School of Business for 25 years and the director of the Casden Real Estate Forecast at the U.S.C. Lusk Center for Real Estate. While teaching statistics in the M.B.A. Core, she received U.S.C.’s highest teaching honor, the University Associates Award for Teaching Excellence, which is awarded each year to only two of the university’s faculty. Professor Conway was the first woman on the Booth School of Business faculty at the University of Chicago, where she served as an Assistant Professor of Statistics and Econometrics. She is an elected fellow of the American Statistical Association and a former chair of the Business and Economics Statistics Section. She has served on the editorial boards of major academic journals, including the Journal of the American Statistical Association. Conway earned two undergraduate degrees in mathematics, statistics and computer science from the University of Wisconsin–Madison, and Master’s and Ph.D. degrees in statistics from Stanford University. Her research interests include statistics, real estate, health care management, finance, law and labor markets and her papers have appeared in many academic journals. In addition to her research in statistics and financial modeling, she is widely respected for her research reports on the commercial and residential real estate markets in Southern California. She is frequently interviewed by the national news media for her viewpoints on the real estate markets and within the last couple of years was quoted by The Wall Street Journal,the New York Times, Bloomberg, BusinessWeek, Forbes, the Chicago Tribune, the Los Angeles Times, the Washington Post, Investors Business Dailyand the San Francisco Chronicle,and has appeared on CNN, the CBS Evening News, the Today Show, MarketWatch and CNBC. Recently, Real Estate Southern CA Magazinelisted her as one of the “50 Women of Influence in Real Estate” in California.